Don't Kiss the Messenger was about a group of athletes at a private high school. It actually came across as more like a college setting since the students lived on campus and had the intense focus of collegiate sports vs. the more relaxed setting I see in our community high school programs. The students are recruited, watch game tapes, have two a day practices, study tables, and tutors to make sure they remain academically eligible. CeCe is the captain of the volleyball team and a star player. She is well respected on campus, but she is constantly looking down on her appearance because of a scar she received in a car accident when she was ten. She has a number of guy friends, but doesn't think a relationship is a possibility for her. Emmett Brady is a senior transfer student and the new starting quarterback. CeCe meets him in her Shakespeare class when they end up getting paired up together for a class introduction exercise. She quickly learns there is a lot more to him than football. He is a gifted music student, intelligent, and extremely good looking. While she is interest in him, she believes someone like him couldn't possible be interested in someone like her. Emmett starts dating Bryn, who is a transfer student on the volleyball team. She is beautiful, but reminded me of Paris Hilton. Her idea of a deep conversation was "He's Hot" or "You have nice hair." Emmett would have ditched her after the first date if it weren't for a little scheme CeCe and Bryn devised. It would be better for Bryn to communicate with him via text and email to break the ice....AKA so she could get CeCe to help her sound more intelligent. Well...as you can imagine the plan backfires every time Emmett and Bryn are together and she can't string a few words together on her own. Emmett and CeCe really start to hit it off via email and their friendship is quickly growing from their in class interactions. 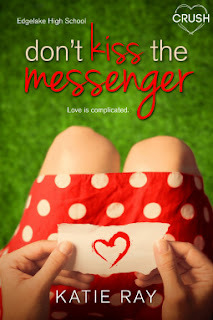 They have a lot in common, but will she find the courage to tell him she is really the "messenger." Overall, I loved reading all of the interactions between Emmett and CeCe. They definitely had chemistry and were drawn to each other's personality and interests. I wish their relationship would have been the major focus of the book, but perhaps that is what will take place in the next installment in this series. I understood the Beauty and the Beast references with the really pretty girl and the scarred girl, but the constant focus on looks was a bit overwhelming. I was more interested in Emmett's music, CeCe's crazy stunts, and the campus sports scene. Those are the things I will remember most vs. who was considered pretty and who was not.